MANILA, Philippines – The Philippines lost its gold medal hopes in the AIBA World Boxing Championships after its last bet, flyweight boxer Rey Saludar (photo), bowed to his American foe in the quarterfinals. 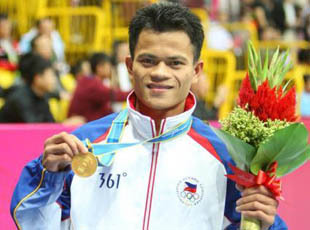 Saludar, a Guangzhou Asian Games gold medalist, was outpointed by Rau’Shee Warren of the United States, 22-12. Warren piled up points early in the fight, scoring 7 against Saludar’s 2 in Round 1. Saludar tried to rally in the next round by mixing it up against the American. He garnered 6 points but gave away 9 in the process. Warren pulled away in the 3rd round, scoring 6 points. Saludar only scored 4. Both boxers were scoreless in the final round. Early on Tuesday, light flyweight contender Mark Anthony Barriga dropped his bout against 2008 Olympic gold medalist Zou Shiming of China.